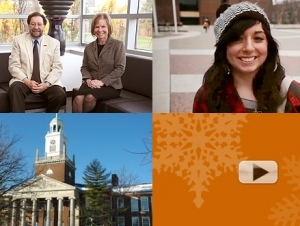 Buffalo State has released its new holiday video—two minutes of seasonal greetings from Buffalo State students and a special holiday message from President Aaron Podolefsky and Ms. Ronnie Podolefsky. The video compiles photos and video taken on campus throughout the year and provides an overview what makes Buffalo State such a special place to live and learn. “In this season of holiday cheer, we are grateful to celebrate a wonderful year at Buffalo State and the positive difference we have made in the lives of our students. On behalf of all of us in the Buffalo State family, Ronnie and I extend our warmest wishes for joy, good health and peace to you, your families and friends, and a new year of renewed hope and happiness. Produced by the College Relations Office and Instructional Resources, the video was distributed as an ecard to approximately 40,000 alumni, faculty, staff, emeriti, and friends of the college and has been posted to Buffalo State’s official YouTube channel.